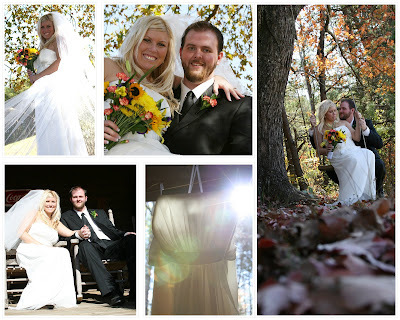 I had the pleasure of photographing the wedding ceremony of Meagan and Aron Carroll at Sampson's Hollow on Nov 1st. They couldn't have picked a better day to get married. The weather was perfect and the trees were incredibly colorful. They were great to photograph because they were so laid back and just enjoyed their day. They drove down from Michigan with a bunch of family and friends to get married in East Tennessee. They had the ceremony in the glen which is a little open area surrounded by trees. Their pastor came down from Michigan to marry them in a beautiful ceremony that brought many tears and much joy. Although we were a little pressed for time, we still got to shoot in a lot of the beautiful locations at Sampson's Hollow and had a great day. Congratulations Meagan and Aron! !